We are getting closer to the World Cup and to put focus on the next generation of legends, PUMA has decided to drop this awesome Future NEXT pack. The pack is made to be used by 6 talents, who took the journey from the local street pitches of their neighborhoods and on to the grass arena of legends! The Future boots are made for the most instinctive and unpredictable creative players in football, who all uses flair to show off their own style of football. The PUMA Future NEXT Pack is going to be used by 6 talents, who has taken the hard journey to become a top-level player. The NEXT pack has been given to Allan Saint-Maximin, Mahmoud Dahoud, Giovanni Lo Celso, Joel Latibeaudiere, Simone Edera and Koya Kitagawa. They might seem like unknown players, but they have shown that they can compete in some of the best leagues in the world. This is something which also is expressed through the graphics of the boots, which has taken inspiration from the journey the players have taken. The Future NEXT is made with a green heel and collar, while it fades over to a greyish colour on the rest of the boot. The grey coloured part tells the story of the players’ youth, playing football on the streets and concrete pitches. While the green heel and collar tells the story of their present life, where the players are evolving on to become the new legends of the game. Allan Saint-Maximin plays for Nice and the France U21’s team. He is an example of a player that came from the street and evolved his game to become a first team player at Nice. Saint-Maximin is an incarnation of the Next Generation mantra: from the street to the pitch. He shows how you can go from being a rough diamond to a jewel. Mahmoud Dahoud was born in Syria, neat the Turkish borders, and came to Germany with his family when he was 1-year-old. It was here, in the streets of Reusrath, that the young player kicked the ball around in the streets. Since then he might have become one of the most exciting young players in the world. Giovanni Lo Celso is born and raised in the town of the district of Santa Fé in the city of Rosario, which is the 3rd biggest city in Argentina. Santa Fé has always had geniuses running around in the streets, and the latest is Lo Celso. He is living any young Argentinian kid’s dream, going from the dusty roads and on to the Argentina national team. Despite his young age, Joel Latibeaudiere has already got some great achievements. Last summer the Manchester City player won the U17’s World Cup with England. He might just be one of the most exciting and talented defenders at the moment, and his elegance and confidence on the ball comes from the street pitches of his younger playing days. Simone Edera is born and raised in Turin and would run around in the street as a young boy, while playing football in his replica Torino shirt and dreaming to play for ‘I Granata’. 13 years later Edar is still working on becoming the home town hero on Stadio Olimpico Grande Torino. In the city of Shizuoka, you can gaze the impressive Mt. Fuji. This was something the young Koya Kitagawa did as a young boy, while he played football in the streets. He new he had to work hard to climb the top, and with impressive skills he went from the street and into the top of the Japanese leagues and is a part of the S-Pulse first team. Did you also go all the way from the streets and on to grass arenas? Then the PUMA Future NEXT is made for you! 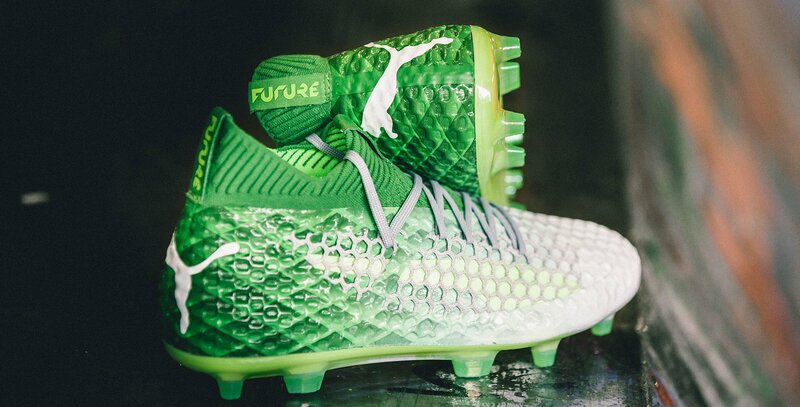 Get the limited edition PUMA Future NEXT boots right here.